YOU DESERVE TO BE the centerpiece of your wedding DAY. I've never felt as beautiful and loved as I did on September 26, 2015. That was the day that I married my dream guy at my dream wedding. Everything -- from my florals and decor, to my natural, vintange-inspired wavy hair -- was perfect. Just like I'd spent the previous year and a half planning and dreaming about. I'd painstakingly hand-selected the area's finest vendors, and there I was on the morning of my wedding in my white satin robe, surrounded by my best girlfriends, watching my vision become a reality right before my very eyes. My wedding day was the best day of my life, and it was in those moments of joy that I decided that I would help other Brides set the stage for their moment in the spotlight! Truth is, you can absolutely have your dream wedding where all the pieces flow together effortlessly. 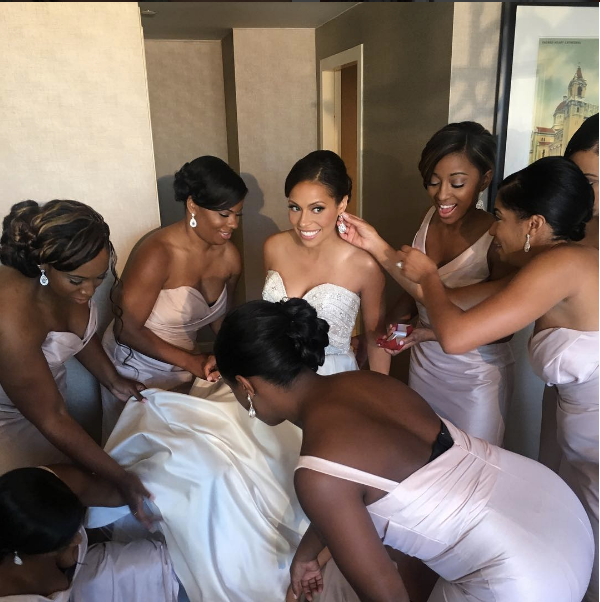 One where you feel the most beautiful and surrounded by love that you've ever felt -- but you have to build the perfect team of Bridal pros who know how to make your wedding day vision a reality. I'm in the business of helping Brides have their dream weddingS. The experience of working with me is unlike any other Makeup Artist you'll find. I go deep with my Brides. I'm the person that works with the Bride most intimately on her wedding day. I set the tone and the pace for that morning. I form a bond and a friendship with my Brides in the months leading up the wedding. And I take the time to fully understand her vision for her day from start to finish because I truly understand what it takes to put together a flawless wedding day and... well, I care. Not to mention, you'll get high end, red carpet-worthy makeup where you'll look like the most beautiful, elevated version of yourself! Working with Brides in this intimate way is time intensive, and as such, I only accept a small number of weddings each year. If this sounds like the experience that you want for your wedding day, I invite you to click the button below to submit your Bridal profile so that I can start getting to know you and your vision! It is best to fill out the form on a desktop or laptop computer, and please take the time to fully respond to each question and be as descriptive as possible. The more you can tell me about your wedding, the better. If I find that we're a good fit, I'll create a custom bridal package that is specific to your event and we'll set up a call so that I can walk through the details with you. I hope to have the pleasure of speaking with you soon!